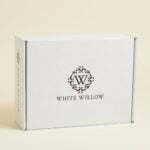 Check out the latest White Willow Reviews on My Subscription Addiction! How do subscribers rate White Willow? Do you subscribe to White Willow? Add your rating now! "You get all 3 it is a trio."